DESCRIPTION A mature semi detached bungalow with brick and rendered elevations under a tiled roof affording much improved accommodation presented in excellent decorative order and including a loft conversion and conservatory. Benefiting from gas central heating and double glazing the bungalow comprises an entrance hall leading to lounge and double bedroom at the front, bathroom, modern kitchen at the rear leading to the double glazed conservatory, a separate dining room with staircase to the first floor loft conversion which provides a landing, study/bedroom area and leads to a separate further bedroom. The property occupies a good size plot with gardens laid out for ease of maintenance and a shared drive leads to the single garage at the rear. 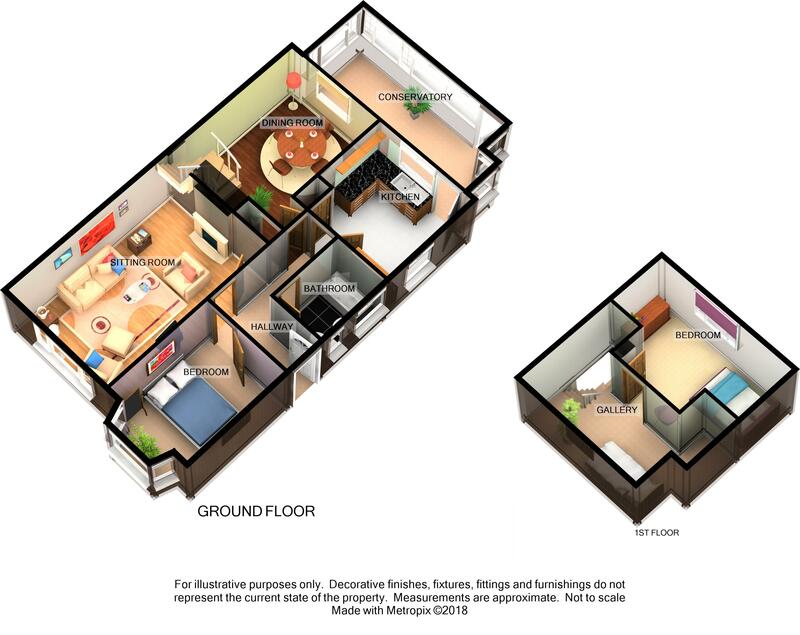 A superb bungalow in a convenient location and an internal viewing is strongly recommended. SITUATION The property occupies a convenient position in a sought after cul de sac within walking distance of the town centre, hospital, etc. LOUNGE 14’5” (4.4m) x 12’2” (3.7m) having a small pane glazed door from the hall, double glazed window to the front, radiator, power points, wall lights, polished stone fireplace incorporating an electric fire and coved ceiling. BEDROOM ONE 9’1” (2.76m) x 11’ (3.36m) plus bay window having radiator, coved ceiling, power points, TV aerial point and double glazed bay window to the front. BATHROOM having a white suite comprising a panelled sitting bath with mixer tap/shower head over, pedestal wash basin, close coupled WC, vinyl flooring, radiator and two double glazed windows to the side. CONSERVATORY 17’ (5.17m) x 7’6” (2.28m) UPVC double glazed on a brick plinth with polycarbonate roof, vinyl flooring and radiator. 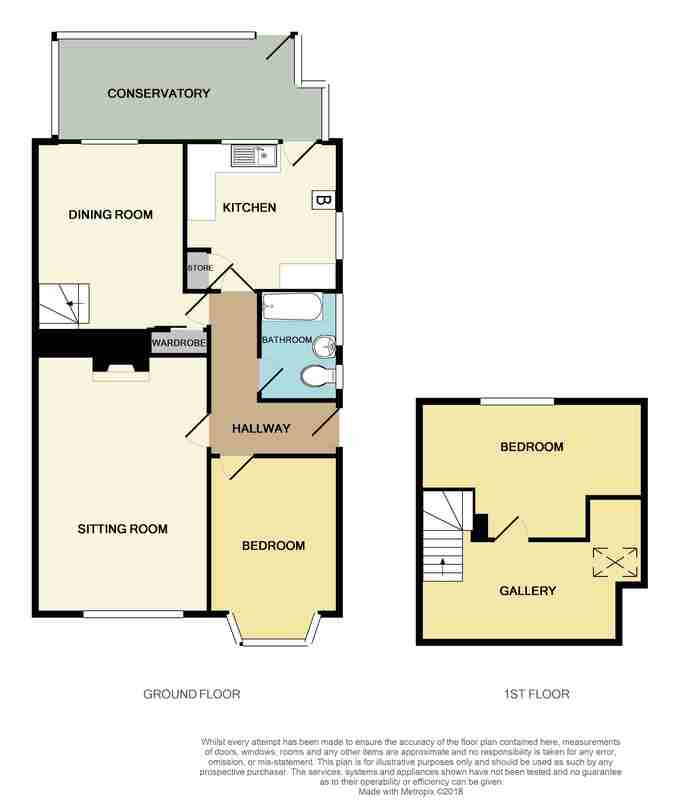 BEDROOM TWO 9’9” (2.97m) x 13’10” (4.22m) max with radiator, fitted drawer unit, access to the eaves storage cupboard, power points and double glazed dormer window to the rear. OUTSIDE The property occupies a good size plot with landscaped gardens laid out for ease of maintenance featuring hard landscaping areas, gravel and paving, central flowerbeds and borders and a small kitchen garden behind the garage. A shared drive leads to the SINGLE GARAGE 16’3” (4.95m) x 8’7” (2.62m) with up and over door, light and power connected and UPVC double glazed door and window to the garden side. OUTGOINGS The property is in Band C for Council Tax purposes with the annual amount for 2018/2019 being £1,544.47. 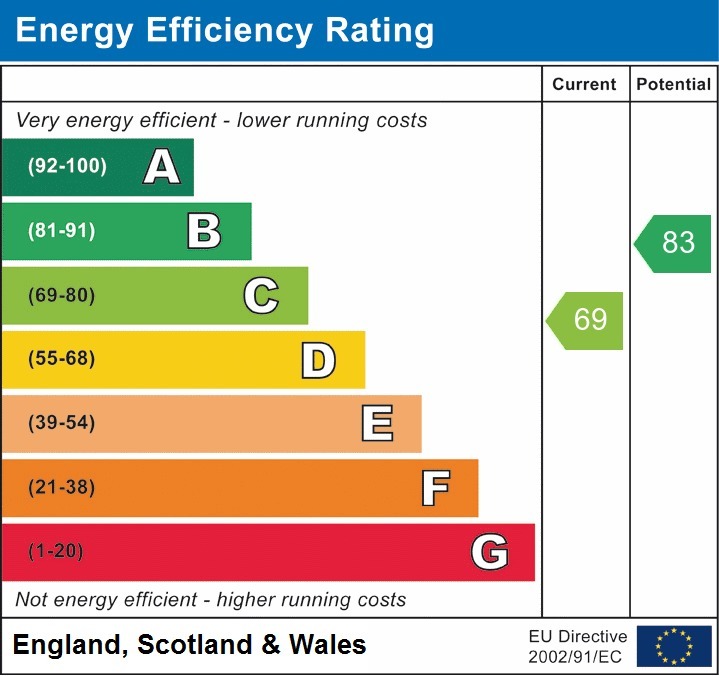 Energy Efficiency Rating C.
VIEWING By appointment through Edwards on Yeovil (01935) 423434 or Somerton (01458) 273502. AGENTS NOTE None of the services or appliances have been tested by the Agents. Edwards is a long established independent Firm of Residential Sales & Letting Agents with offices in Yeovil & Somerton covering the sought after South Somerset region.